Late morning on the shadow side of the distant mountain, the air is already so hot the horizon undulates for miles, when just hours ago the barrenness was so frigid he’d shared breath with huddled animals. Moses can smell burnt dirt and grass under the harsh odor of either himself or the rutting goats. Pathetic animals are goats and sheep. Always falling into a crevice or ravine; always running away when you call them; always hungry and thirsty; always head-butting and locking horns; always wandering around in every direction at once; never know where they’re supposed to go; always bleating for something. The wide-open silence is so penetrating he hears his fingernails scratching against the woolen-felted skull of an ewe that nuzzles and nibbles against his fingers. He strokes her upturned face. His stomach growls as the wind blows hot air and sand from a long distance up his flapping tunic and rattles the few dried weeds, but all he feels as he leans against his gnarly staff, looking out over the remote wilderness, is useless. Stupid. Once the educated, accomplished, prodigious Prince of Egypt, but now exiled. A stinking fugitive goat herder. Named to be a deliverer of his Hebrew people, but washed up now. Finished. Abandoned. Punished. If anyone knows he deserves this grit rather than a silver spoon in his mouth, it’s him. He’s been out here in the “desolate places” of Mt. Horeb, on the run, for forty years, the coulda-beens replaying over and over in his mind. People used to bow to him. But now, not even the sheep hear his voice. There’s nothing left of that life. It’s all been completely stripped down, cut off, and excised out here in the desolation. Ah, well, the same acute sense of righteousness that once provoked him to murder assures him he deserves this life-sentence. If you can’t run with pharoah’s chariots, then get thyself to the desert, is his attitude, as he catches sight of a flame leaping up out of the distant heatwaves. Is the sand on fire? he thinks, and then feels stupid again. There’s not enough vegetation out here to burn. But it’s definitely fire. Must be a dittany shrub. He knows those scraggly bushes always burn themselves out in a minute’s puff, so his attention wanders. He watches without seeing it, and wonders about his mothers back in Egypt, one his Hebrew birth mother, the other his Egyptian adoptive mother. Is she ashamed? Angry? Alive? He stabs the staff into the dirt and kicks at the dust he raised. Where is the God of Abraham, Isaac, and Jacob out in this forsaken wilderness, this vast open sky, this yawning abyss? Where? Nowhere. As though Moses had earlier spoken his thought aloud, the blazing bush thunders, “I AM the God of Abraham, Isaac, and Jacob,” as he calls him out of the desert to the salvation Moses was named and had been preparing for all along. I think one of the most precious realities about life with God is that throughout the Bible and salvation history, when he desires to do “a new thing” (see Isaiah 43:19), he always uses some insignificant, startled human creature. Terrifying them with the exhilarating invitation to do their hearts’ secret longing, he scours them from the inside out; gouges glorious holes in their souls with his unpredictability and impossible demands; fills them with his burgeoning Presence; and one day long, long after, they all find themselves blinking with stupefied wonder at what he has finally wrought. “He is your praise; he is your God, who has done for you these great and terrible things which your eyes have seen” (Deuteronomy. 10:21). So it was with Moses, born under the curse of an Egyptian Pharaoh who practiced population control against the Hebrews. All the male babies born to Pharaoh’s Hebrew slaves were thrown into the Nile and drowned. In an act of pure love and hope, Moses’ Hebrew mother cast him into the river in a little wicker basket that floated straight into the arms of one of Pharaoh’s daughters. Having been bathing in the river at the time, she plucked the little circumcised baby out of the water and named him Moses, meaning drawn out. “He assumed (his) kinsfolk would understand that God was offering them deliverance through him, but they did not understand” (Acts 7:25). Presuming to free the Hebrews in a way God had not chosen, he murdered an Egyptian taskmaster, and was forced to flee Pharaoh’s retribution. On the back side of the desert, in the shadow of Mt. Sinai, Moses married a maiden and tended flocks for his father-in-law for another forty years. Sinai means desolate place. Consigned to desolation, surely Moses had irrevocably lost the chance to fulfill the dream he was named for, and that he carried in his heart for so long. “For the gifts and the call of God are irrevocable” (Romans 11:29). Pharaoh was dead (see Exodus 2:23-25). 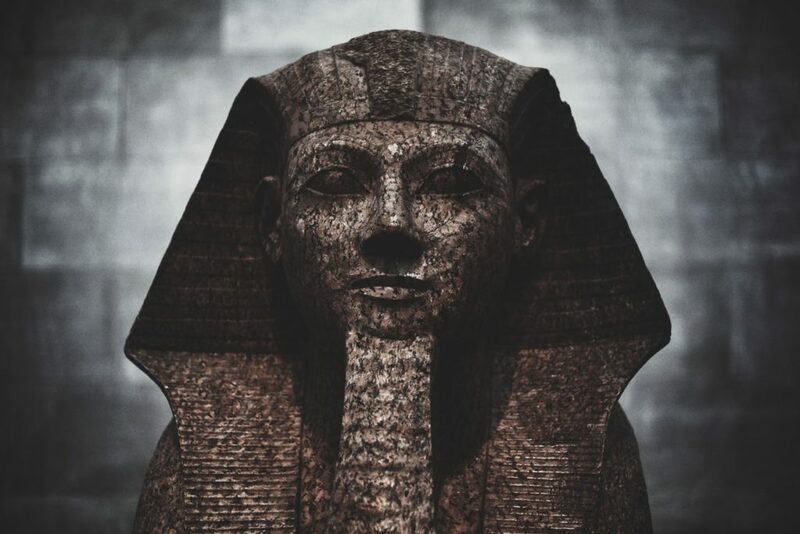 Upon the death of any pharaoh, Egyptian authorities dropped all pending charges against those who had been accused of crimes, even in capital cases. Moses could go back to Egypt. But in the time Moses had been gone, the plight of the Hebrew slaves had reached a fever pitch. The terms used to describe the Israelites’ affliction—groaned; cried out; cry; and groaning—each have corresponding verbs to describe God’s response to his oppressed people. God had heard, remembered, looked, and acknowledged them. Throughout his time in the lonely desert, Moses was emptied of his own ideas, his own reasons, his own plans, and his own timing. Moses was being prepared to accomplish the purpose God intended for him all along. He was finally ready to hear. The biblical number of gestation, Moses spent forty years thinking he was somebody, forty years learning he was nobody, and forty years experiencing how God makes somebody out of nobody. “When the LORD saw that he turned aside to see, God called to him” (Exodus 3:4). It was an event God’s people would remember forever. A murderer, called to mission. A man with a heart for justice, called to be the Law-bringer. A fugitive, who leads a people to freedom. Dear Jesus, forgive me for believing I could run from my sin. I pretended that you did not see me and expected no one would know, but it has separated me from what I love and exiled me to a lonely barren land. Today, help me to cooperate with my desert surroundings to do away with all the trappings of sinful Egypt that crowd and drown and suffocate your work in me and deceive me into thinking I, alone, can do what you ask. Help me to hear your voice in my desolations, so I can encounter you on a level that will transform me forever. Like Moses, I know what failure feels like. But I also want to experience you, to hear you speak in that fire and flame, to remove my shoes in awe, and leave your presence ready to change the world. Please call me forward, Lord, to where you are, be it desert loneliness or barren wilderness. I am at the foot of the desolate mountain, wandering around, killing time, awkwardly groping for you. And as you summon me, make me know in my depths that even while I ran from my guilt, you were already waiting for me in the desert. Sonja Corbitt is an accomplished author and broadcaster who produces high-impact, uplifting multimedia Bible studies. A North Carolina native who was raised as a Southern Baptist, Corbitt converted to the Catholic Faith and is in formation as a Third Order Carmelite. She is the host of the Bible Study Evangelista Show, a writer for the Ascension Blog, a contributor to Magnificat, and bestselling author of Unleashed, Fearless, Ignite, and Fulfilled: Uncovering the Biblical Foundations of Catholicism. Her most recent book is How to Pray Like Mary published by Ascension.